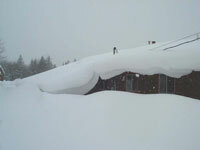 This has certainly been a winter for many people around the country, Grand Marais included. I have lived here since 1994 and this is the most snow I’ve seen for this time of year. As of about a week ago, our official total was almost 180 inches! 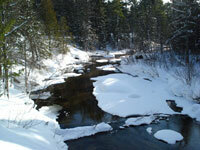 It has also been a cold winter, although Grand Marais has not been as cold as some other areas in the U.P. This morning we were around 5 below with a wind chill of 30 below! Other communities were nearly 30 below ambient! 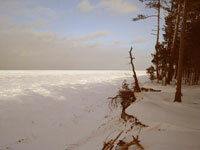 Lake Superior is still not frozen very far out – only around a ¼ to ½ mile from shore. The good news is that the warmer waters buffer our temperature. The bad news to some, other than us skiers, is that the difference in temperature (warm lake vs. cold land) creates almost daily lake effect snow. All of the pictures this month, of course, feature the snow. The first is a shot I took on one of the very few sunny days we have had this winter. It is a picture of the Sucker River in the School Forest. Most of the river is frozen, at least on top. However, the current is swifter in a few places to enable these terrific, high-contract photos. While in the school forest last week skiing with my friend, Dianna Bell (Bayshore Market), we skied all the way to Goebel Beach. As you rockhounds can see in the next photo looking east from Goebel, there are no rocks to be seen. This is the first time this winter I’ve skied to the lakeshore through the school forest. I was hoping there would be BIG ice bergs, which there were not. There is a lot of float ice, though, that will pile up and form into giant ice bergs if we get a stiff wind from the north. When I cross country ski with my friends, we usually ski the trails in the national park. These trails and those in the school forest each have their pluses and minuses. The PRNL trails are groomed more frequently, have a wider array of ecosystems, are straighter so you can ski faster, and have more hills. For me, they are also convenient since they are located only a ½ mile from my house. The school forest trails wind along the Sucker River, through expansive fantasy-like pine forests, and with bushwhacking on the snowmobile tracks allow access to the beach east of town. The picture included here was taken from Trail E in the national park, which is located above Sable Falls. 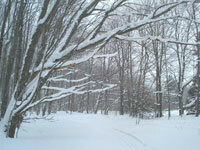 The last picture featured this month was snapped on the south side of my house during a January 17th snow storm. Because my house is located on the top of a glacial terrace hill, the snow blows up the hill and over the roof to deposit on the south side. You can see that the snow on the roof was actually connecting with the ground. The size and length of the “tunnel” of snow covering my house was growing each and every day. Finally, I had to purchase a snow rake and pull the more than 5 feet of snow off my roof. Now the drifts behind my house are even taller – between 10 and 12 feet high covering more than half of the south-side windows!